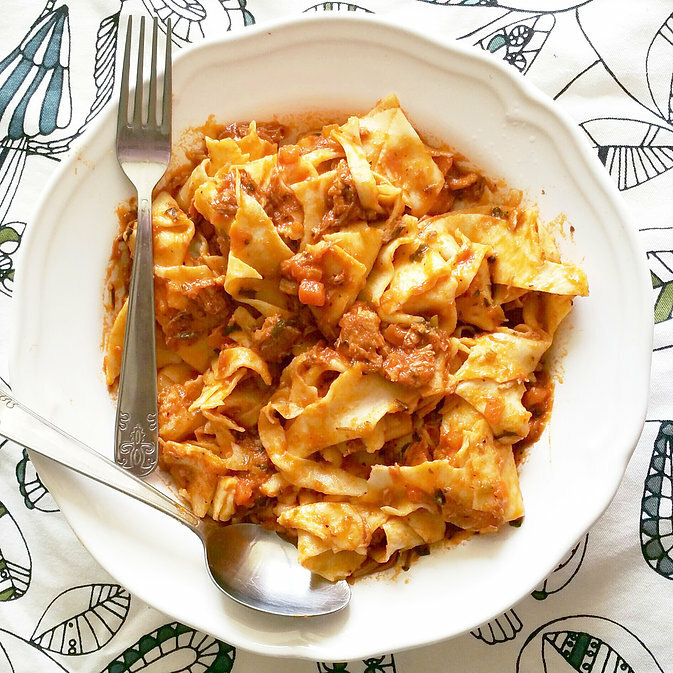 I created this recipe when mentioning to my husband that I would perhaps make a pork ragu for dinner but only on the condition that he run to the store and bring back what I needed. What he came home with was a plethora of pork and pork products and a challenge-to make a damn tasty ragu. Needless to say, it’s been his favorite version ever since! Although this recipe is not traditional, the addition of chorizo gives the sauce a bit of a punch that compliments the tomato and pork in a way that can best be described as addictive. Best served with fresh tagliatelle and/or crusty bread with freshly grated cheese on top. In a large cooking pot, heat 1-2 tbsp on oil on medium/high heat and add the diced pork shoulder. Season with salt and pepper and cook just until the meat has been seared and is brown. Remove pork with a slotted spoon and put in a dish, set aside. Add chorizo to remaining oil and cook until you see that the oil has picked up the color of the chorizo (it should have a reddish hue). Add diced onions, garlic, diced carrot and diced celery then lower heat to medium and cook until vegetables are soft and beginning to brown. When onion/carrot/celery mixture is soft and beginning to brown, add bay leaves, rosemary, oregano and smoked paprika. Stir and cook for 1 min. Add wine and broth to the mixture along with the pork bones, making sure they are fully submerged in the broth. Place a lid over the pot and cook at medium heat for about 5-10 minutes to allow all the flavors to marry together. Finally, add the browned pork shoulder, one bottle of Passata, Italian seasonings and stir. Add about a liter of water or however much water that you can fit into the pot. Increase heat and bring to a boil then reduce heat and allow to simmer on low heat until much of the water has evaporated and the chunks pork shoulder have disintegrated into the sauce. This should take anywhere from 2-3 hours. You can do this on the stove or transfer to a slow cooker, if you want. Add more water if needed, season with salt and pepper at the end. Best served with homemade tagliatelle or rigatoni and crusty bread. In a large cooking pot, heat 1-2 tbsp on oil on medium/high heat and add the diced pork shoulder. Season with salt and pepper and cook just until the meat has been seared and is brown. Remove pork with a slotted spoon and put in a dish, set aside. Add diced onions, garlic, diced carrot and diced celery then lower heat to medium and cook until vegetables are soft and beginning to brown. When onion/carrot/celery mixture is soft and beginning to brown, add bay leaves, rosemary, oregano and smoked paprika. Stir and cook for 1 min. Add wine and broth to the mixture along with the pork bones, making sure they are fully submerged in the broth. Place a lid over the pot and cook at medium heat for about 5-10 minutes to allow all the flavors to marry together. Finally, add the browned pork shoulder, one bottle of Passata, Italian seasonings and stir. Add about a liter of water or however much water that you can fit into the pot. Increase heat and bring to a boil then reduce heat and allow to simmer on low heat until much of the water has evaporated and the chunks pork shoulder have disintegrated into the sauce. This should take anywhere from 2-3 hours. You can do this on the stove or transfer to a slow cooker, if you want. Add more water if needed, season with salt and pepper at the end. Best served with homemade tagliatelle or rigatoni and crusty bread.